"Groovy. Sam Raimi sequel/remake to the 1981 cult hit is even more over the top. 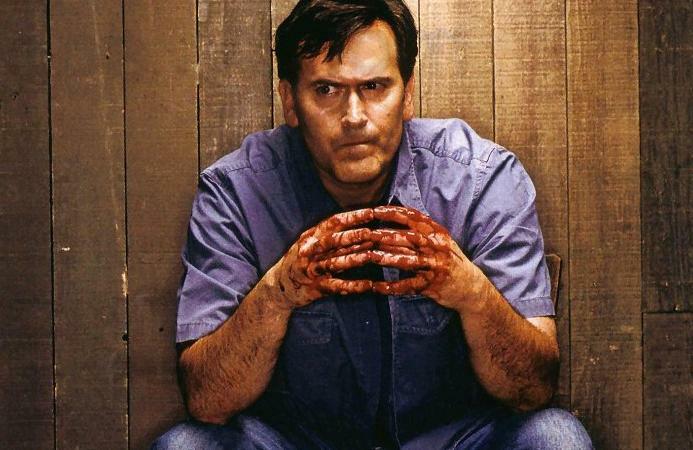 Ash (Bruce Campbell) takes his girlfriend Linda (Denise Bixler) to a cabin in the woods. He accidentally releases an evil force when he reads passages from the Book of the Dead. Ash ends up decapitating Linda after she becomes possessed. In fact, this evil force ends up possessing everything in this movie. At one point, Ash's hand, after being bitten by Linda's severed head, starts smashing dinner plates over his head. Ash cuts his possessed hand off and decides to attach a chainsaw to the stump. 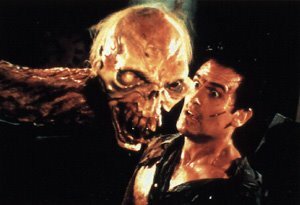 It's funnier than "Dead Alive," and it has the best ending of the "Evil Dead" trilogy." You can catch the full article here. Happy Halloween. Nathan Fillion Is God or Bruce Campbell?